As we move further in our understanding of the importance of communication in our society we comprehend more and more the power of sign language. Allowing those without the ability to speak according to social norms and those without the ability to speak yet the ability to communicate has opened a whole new world to our eyes. Now, we are beginning to understand how sign language can be beneficial to individuals with autism, something that anyone with a loved one with autism will want to investigate for themselves. Sign language is a great tool for individuals with autism because it allows them to skip the difficulties presented by vocal communication. Many who struggle with autism struggle mainly by not being able to communicate verbally and express vital wants and needs. With sign language, this hurdle is eliminated and a sense of power and independence is restored to the individual. But is there any proof that sign language has been successful for individuals struggling with autism? Many studies (Mirenda and Erickson, 2000; Mirenda, 2003; Tincani 2004) have shown that “manual sign language has been shown to support the development of vocal verbal behavior in some individuals with autism and developmental disabilities”. This doesn’t mean that sign language will resolve all problems with autism for all children, but it does give hope to those still searching for the right treatment. There are those that contend that sign language has little or no benefit for certain students with autism, but this is the case with almost any treatment for autism or related developmental disorders. The fact is that no one treatment will work for every individual with autism, but it is an option that has worked for some individuals with the disorder. Don’t give up if the process doesn’t work for your loved one, continue to consult with your doctor or therapist for the next course of action. Autism Still on the Rise but Is There a Cure? 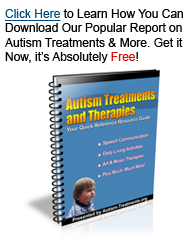 How Do You Know if Autism Treatment Works? Who Covers the High Costs of Autism? MEDICAL DISCLAIMER This web site should not be used to make diagnoses, administer treatment, prescribe medications, or order tests related to Autism, Aspergers or any other medical condition. The information contained this website is provided as an educational service, which may help you in your personal research on Autism-related topics and other medial conditions. This web site should not serve as a replacement for the relationship you have with your physicians, therapists or any other healthcare provider. The information provided on our website(s) is not medical advice and should not be construed as such or be substituted for regular consultation with your healthcare provider. You should contact your physician or health care professional immediately if you have concerns about your health or the health of someone close to you.